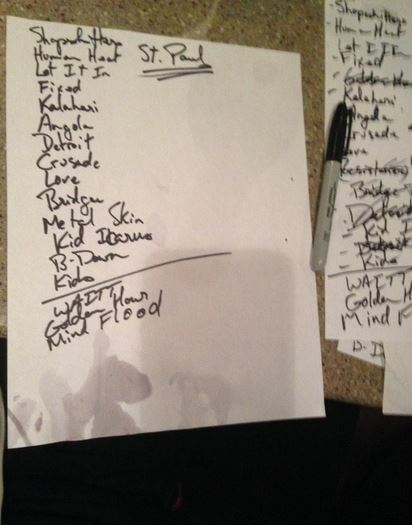 this wine-stained setlist from the st. paul, minnesota turf club is pretty spectacular. tweeted friday night by sam himself, no less. critical debate and analysis portion of the show: the resistance (ever elusive these days) only made the draft, but the even-more-elusive mindflood closed the show. (also, lions of the kalahari). what does it all mean, sam?! we’ll probably never know. 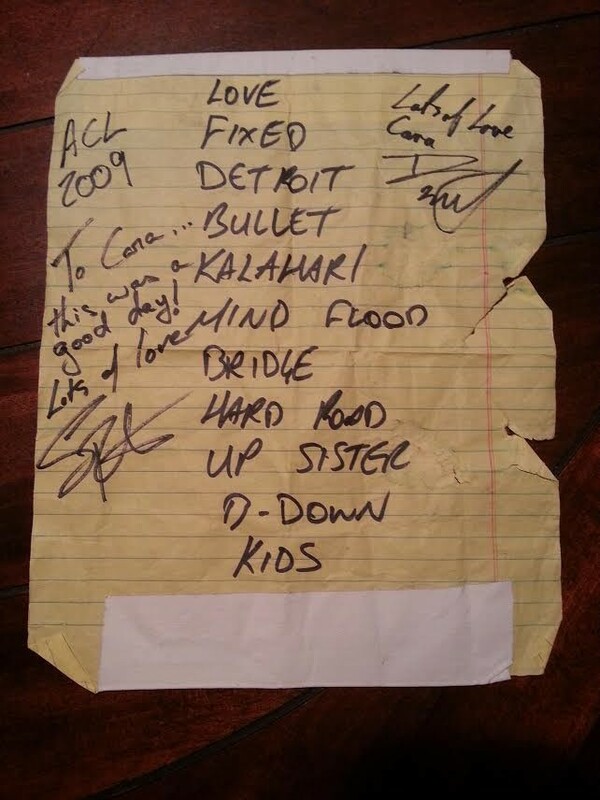 1. this handwritten setlist, completed with spilled drinks and an iPhone shadow, is perfect, and inspired me to start a new tab i’ve very creatively called “setlists.” i’ll add as many as i can, and if you want to tweet me your SRB setlist pics, i’ll post those, too. then if we feel like scrolling setlists, we can scroll setlists. so what if i like setlists? don’t make this weird. 2. i asked sam about setlists. it was the first thing we talked about. it wasn’t weird at all. what goes into the setlist? that’ll be me. if it’s one of those days, where i wake up and it’s the first thing on my mind, i’ll do it right away because it takes about an hour. now the clock’s ticking, i know that sometime between – what time is it now? it’s 5:22, and we’re on at 9:15 – so, when we’re done, i’ll go write the setlist. i want every show to be its own experience. i want that for the audience, and i think the band thrives off of it in a way. as much as there’s comfort and familiarity in playing a similar set from one night to the next, beyond two nights you feel like you’re stagnating a little bit. you don’t feel as motivated up on stage. often certain parts will stay. you can’t have a free for all, and it still has to build and flow in certain ways. so there’ll be certain parts of the set that will remain consistent from one night to the next, but then there will be a whole other section of three, four song groups that change constantly, and what songs you put in those, that’s what keeps me constantly thinking. i do it myself. we have a catalogue of material. for this particular tour, we’ve culled the herd down to the songs that we’re rehearsed enough to play. we went back to montreal after our tour in spain, and said we’re going to be playing much longer sets now, and we’re going to be playing for people who have a deeper history with the band – let’s be able to go back to our first couple of records and pull out a song if we want to. unfortunately, they’re not stored in our short-term memory, so we have to practice and rehearse. i think we rehearsed about eight or ten songs that are not in constant rotation, and we just tried to hammer them out. that doesn’t mean they’re going to be in the set, but if they need to be, then they can. every night of this tour, we’re trying to play at least one or two songs we don’t normally play. does it get easier as there’s more songs to choose from, or more difficult? it’s not that it’s hard to pick those songs, it’s hard to make a setlist cohesive sounding. especially if your records tend to go off on a tangent from one to the next. lo-fantasy and collider are easily married in a setlist. there’s parts of love at the end of the world, and there are elements of chemical city, and even fewer elements of we were born in a flame to be able to make a set that feels like it’s not just pulling itself apart. we lean heavily on our latest record. we’ve always done that. we play a lot of lo-fantasy, and we use bits and pieces of other records to complete the setlist every night. speaking of setlists . . . to celebrate our new setlist category here at the bootleg saint, here’s an insane out-of-the-gate offering courtesy of cara in edmonton. 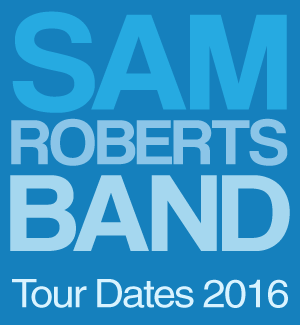 ladies and gentlemen – the sam roberts band at austin city limits, in october 2009 – thank you, cara! This entry was posted in news on November 23, 2014 by annie.